Prutha Vaze provides an insider’s perspective on developing the Maharashtra State Climate Change Policy. Ms. Vaze, a Technical Expert for the Action on Climate Today (ACT) programme, has been embedded with the state government for the last three years. Maharashtra state is reeling from the impacts of climate change, and particularly from frequent droughts in rural areas and floods in urban areas. The frequency of droughts in semi-arid regions of Marathwada and Vidharbha is now once in every five and six years respectively. The state government is gradually recognising that in order to meet citizens’ basic development needs, it must integrate climate change concerns into its development planning and implementation processes. I first started working within the Government of Maharashtra’s Environment Department, as an embedded technical expert from the Action on Climate Today (ACT) programme, in 2015. At the start of the programme, the state government had a growing interest in mainstreaming climate action into development, but lacked the institutional mechanisms, technical frameworks, and scientific data and analysis to do so. Over the last 3-4 years, the government has transformed its policy framework and institutional approach to managing climate change, and the results are starting to show. 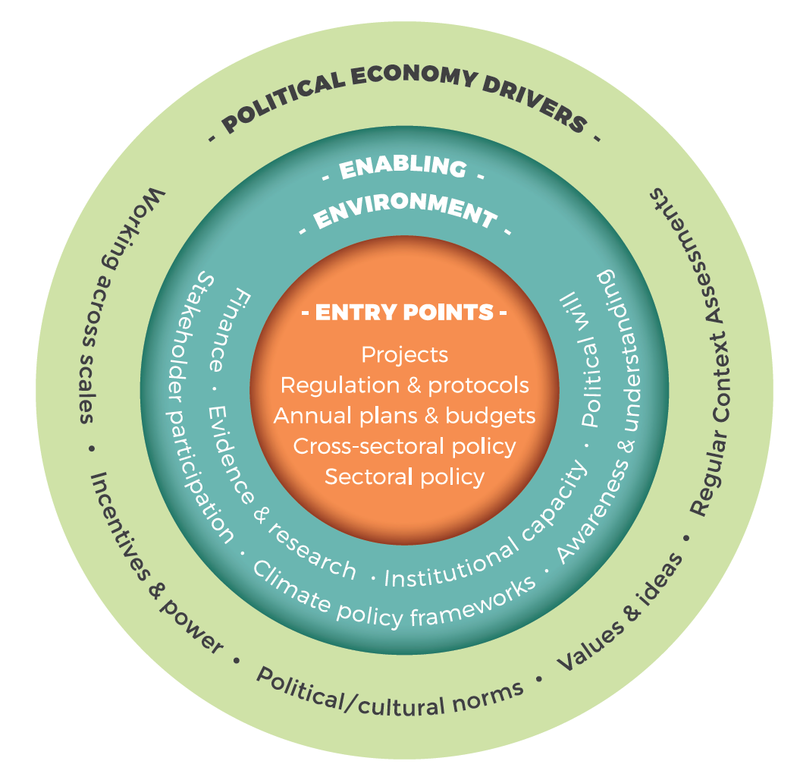 Strengthening the governance of climate change adaptation has required using entry points for mainstreaming adaptation into specific sectoral policies, plans and projects. It has also involved strengthening the enabling environment or ‘system’ that supports mainstreaming, including building institutional capabilities, leveraging finance, and developing cross-sectoral climate change policies and commitment. In addition, all our work is informed by analysis and understanding of a set of political economy drivers specific to Maharashtra. In 2010, following a directive from the federal government, the Government of Maharashtra commissioned a research institute to draft its State Action Plan on Climate Change. The plan had broad strategies for major economic sectors but lacked sufficient guidance on implementation and was not adopted. Maharashtra needed a more detailed plan with concrete measures for delivery. As a result, the Department of Environment and ACT worked to draft a State Climate Change Policy, which was adopted by the cabinet in 2017. The Policy presented a framework for each sector to initiate climate change mainstreaming into their plans and budgets. With the political weight of the cabinet approval, line departments have developed Sectoral Climate Action Plans to implement the policy. These plans crucially include an evaluation of costs and benefits for priority actions and relevant monitoring and evaluation indicators. The state government has also approved new institutional structures for managing climate change: a high-level Steering Committee on Climate Change to provide overall strategic guidance and a Climate Change Cell within the Environment Department to coordinate and lead the day-to-day work related to climate change. However, for effective implementation of the policy framework, enhanced and sustained political will is necessary. ACT supported the state government to organise an awareness session for parliamentarians during their annual Budgetary Parliament Session in March 2018. This was a major milestone and led to a Committee being formed to monitor implementation of the State Climate Change Policy with parliamentarians chaired by the Chairman of the Maharashtra Legislative Council and co-chaired by the Speaker, Maharashtra Legislative Assembly. – The government has widespread challenges and constraints in terms of limited institutional capacity, bureaucratic inertia and ad hoc political will. These need to be overcome before a suitable enabling environment for sustained action on climate change can be achieved. – ACT’s most significant intervention may have been its constant communication with decision-makers in the state on the need for a policy and institutional framework for climate change. It took nearly a year of engagement, support and technical advice before the Climate Change Policy was adopted. – The agencies formally charged with leading on climate change – in this case, the Environment Department – are usually not the most powerful departments in Indian states. As such, it was crucial to have the support and backing of very senior bureaucrats with cross-sectoral mandates, as well as parliamentarians. – The cost benefit analyses presented as part of the Sectoral Climate Action Plans indicated minor modifications required in existing budgets. These analyses were instrumental in helping departments to decide that they could adopt the policy recommendations. ACT’s experience in Maharashtra and the other locations has been documented in the learning paper – ‘Mainstreaming adaptation to climate change within governance systems in South Asia’. This learning paper elaborates on the conceptual approach, challenges and opportunities for advancing robust action on climate change adaptation. For more information, contact Prutha Vaze prutha.vaze@actiononclimate.today. ACT is a regional DFID-funded programme, managed by Oxford Policy Management (OPM), that aims to strengthen systems of planning and delivery for adaptation in South Asia.